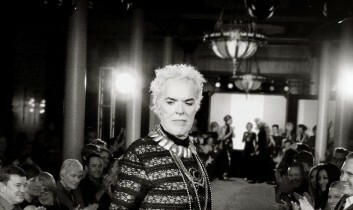 he stage was set at the Driskill Hotel Sunday night for a much anticipated fashion show by a well-known Austin fashion face, Stephen MacMillan Moser. While his name is connected with the Austin Chronicle for his After a Fashion weekly column, this night Stephen replaced his writing talents for his more creative design side. Gail Chovan, the long-time, eclectic and very artistic designer and owner of South Congress’ Blackmail Boutique showed a stunning capsule collection (a recap of her Collection 15 is coming from her Tuesday night show) and Tina Johnson and Roosevelt Cevallos (shoes) also showed pieces to make it a wonderful local foursome of fashion collections that walked the runway. The energy at the Driskill show was much like some of the shows I covered in the old days, circa the crazy Club de Ville fashion show days…fast-forward a decade and I felt that same energy Sunday night but everyone was better dressed and the dressing rooms weren’t outside. The well-mannered people you typically see at a fashion show came unglued during Stephen’s set and the fashion party ignited! It was fun, loud, and the models cut loose on the runway with the crowd getting louder with each piece making its appearance. Super fun to see the front row with Ross Bennett, Matt Swinney and celebrity game show host Chuck Woolery cutting it up and having just about as much fun as the models! Austin celebrities strutted their stuff in Stephen’s creations with Editor Kevin Benz wearing tight gold spandex pants and a black embellished shirt and news anchor Tyler Sieswerda squeezed into straight paisley printed jeans and the models kept coming…State Representative Mark Strama, The Society Diaries Editor Lance Avery Morgan, Greg Boyd, Adam Curry to name a few. The women’s collection started coming down the runway with the long dresses shown in classic tight ranged silhouettes. 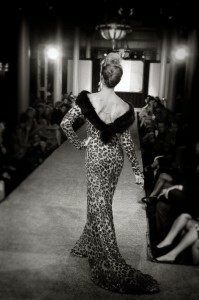 The fabrics from animal prints to silver lame to black and silver sequins and were trimmed with fur. Trumpet sleeves and lace accents were also on of the many details on several dresses. Some of the local famous faces included YNN’s Anne Hudson, Olga Campos, Quita Culpepper, and new Austinite Micky Hoogendijk. Each model took a moment to thank Stephen at the end of the runway for a special fashionable kiss. I have seen Stephen’s previous collections and this one was by far the most wearable to date. The styling was cohesive, not overdone, makeup appropriate and simple. The only oversight I could say about the show was the lighting. It’s an on-going issue that will hopefully improve. When Stephen took the stage, he waved to the crowd and approached Austin American Statesman writer Michael Barnes. He acknowledged Stephen saying “fabulous” and then the tears started flowing. Stephen mentioned that creating this show and collection was a “dream come true” and he made his final thank yous to his muse Jackie O and TexStyles fabric store owner Benson Roberts. Stephen said, “I let the fabric whisper to me”. Let’s hope more fabrics speak to you Stephen cause we want to see more collections and enjoy fashion shows with that loud and enjoyable runway excitement!